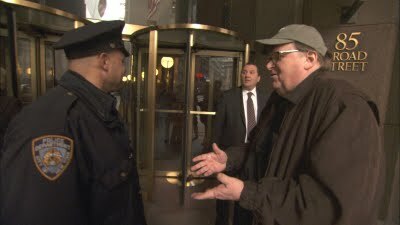 As a person with liberal politics, I agree with many of the positions Michael Moore takes in his new film Capitalism: A Love Story. I’ve been a fan of Moore’s going all the way back to his General Motors expose, Roger & Me, and appreciate the passion and creativity he employs in his art; I say “art” because Moore doesn’t make straight documentaries: they’re message-driven performance pieces that happen to incorporate real-life footage in support of his arguments. He labors in the gonzo spirit of Hunter S. Thompson, revealing hard truths by way of disarming his audience with shtick. Unfortunately, Capitalism—and, to a lesser extent, his last film, Sicko—succumbs to that shtick, muddling his thesis in the process. As a liberal, I’m with him; as a film critic, I think Capitalism kind of stinks. I should qualify that by saying if you’re the kind of Michael Moore fan who sees no inherent problems with destroying capitalism and starting over with a Jesus-style commune planet—better yet, if you actually believe that’s possible—then you may fall in love with Capitalism. However, if you’re a discerning filmgoer who pays attention not only during movies but also in real life (by, say, keeping up with current events) you’re likely to find this movie a frustrating exercise in terms of both storytelling and message. Unlike Moore’s earlier works, there’s no through-line in Capitalism. Roger & Me began as a quest to interview GM CEO Roger Smith; Bowling for Columbine explored gun culture via the 1999 high school massacre; Fahrenheit 9/11 sought to lay out how we wound up in Iraq. All three films had central characters that we followed and learned about in-depth enough to understand how they factored into Moore’s stated goals. Capitalism opens with a montage of bank camera footage capturing robberies, and leads into a montage of people from around the country being evicted from their homes. I guessed that these would be our “protagonists”, but right off the bat, their stories had problems. Perhaps that’s heartless; perhaps not. The point is that Moore never gave the back-story on this family, or why they felt they should be ready for Ruby Ridge Part Two. The footage was apparently not Moore’s own, but he could have at least followed up with the family: why were they being evicted? Was it for not paying the mortgage or for something else? Did they get suckered into an ARM during the housing boom, or were they simply hedonistic slackers (as many of Moore’s critics might argue)? Were they given enough notice between the time the eviction was served and the day the sheriff showed up with his “goons”? Moore could have also, I don’t know, gotten both sides of the story by talking with the sheriff’s department. Was that big of an entourage typical, or were the officers perhaps worried that the people inside might not have planned to leave without a fight? The point is, I wasn’t given nearly enough information to care about these people, and the whole scene felt like a dirty trick. The same holds true for the rest of the evicted families in the movie. We’re meant to feel bad for people who are forced to sell or burn their possessions—as well as for a family who must sleep in the back of a moving truck—but without the benefit of learning how they came to those situations. Michael Moore would have made a much stronger case had he bothered to fill in the audience and get them behind his struggling heroes instead of wasting time with cute stunts like wrapping The New York Stock Exchange in crime scene tape. Capitalism has a pretty strong middle, though. It’s here that we’re given some history of the financial pyramid scheme that nearly destroyed the economy, along with a list of the key players—on both sides of the aisle—that birthed it. We also meet a couple of families who learned that their deceased loved ones’ former employers took out “Dead Peasants Insurance” policies on them, essentially betting on their untimely deaths and then reaping multi-million dollar payouts—that's right, the companies, not the families; all legal, all undisclosed to anyone except via leaked memos. On the bright side, Moore profiles entrepreneurs at a bread-making company who opt for truly democratic workplaces, where everyone votes on corporate policies and practices; the CEO has the same stake as the assembly line worker, and both are able to live very comfortably. It’s an inspiring oasis amid a series of chilling vignettes. The most chilling section deals with the bank bailout; we learn that Congress was flooded with millions of phone calls and letters on the eve of the vote—which, if passed, would have given billions of dollars to the unrepentant fat cats who’d steered our bus off the cliff—and, amazingly, Congress turned their backs on their corporate backers and voted down the measure. That is, until a few days later, when a group of lawmakers met in secret, called for a hasty, new vote, and made the bailout legal. This part of Capitalism is so effective that I forgot my recent history for a few minutes and swelled with pride at the notion that people contacting their representatives can actually make a difference; then the rug was yanked and I became rather depressed. Interestingly enough, there’s a great segment on the Chicago glass company that went on strike earlier this year. The workers were given three days’ notice to vacate the plant after Bank of America refused to back the corporation that owned it. Moore successfully gets the audience on the workers’ side as they state their case and stage a peaceful sit-in that garners media attention and the support of president Obama. This should have been the film’s through-line, rather than an inspired mini-movie bookended by vague, cloying crap. I left the theatre thinking that Michael Moore should have stayed away from the camera altogether and simply produced a movie about the economy with journalist Matt Taibbi at its center. Taibbi’s thorough and thoroughly entertaining articles for Rolling Stone this year have documented the downfall of the big banks and highlighted their practices’ effects on average Americans better than anything in Capitalism. Taibbi writes the way Moore used to film: with an emphasis on the problem and not the man talking about it. It’s gonzo journalism that never forgets which word in that phrase is more important.